Handmade bamboo lamps are a chic way to shed some light on any room in the house. 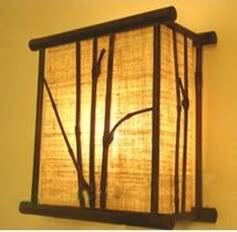 Making bamboo lamps will not only give additional beauty to your home but also give you extra income on your pocket. Selling different kinds of handmade bamboo lamps are a good business venture to start especially bamboo trees are abundant in the Philippines. With some crafting skills and creativity, your handmade bamboo lamps will surely be a hit in the market. Start by removing the cover of the old lampshade to be transformed into a bamboo lampshade – whether it is a cloth or plastic cover. Removing the lampshade from the lamp makes everything easier. This can be done with a razor blade. Pieces of bamboo (can be 1” x 3” thick and 2 ft. long) may either be bought from a local craft supply store or acquired within the neighborhood. The pieces of bamboo to be used must be cured well, and no longer green in color. Green bamboo is prone to rotting since molding may occur. If you have green bamboo, you can cure it by putting it under the sun. After curing, coat the bamboo (now brown in color) with layers of urethane. The size actually depends on the design you have in mind. On the average, 1” x 3” think and 2 ft. long is good enough. You can use a handsaw in cutting the pieces. Make sure they are longer than the length of your lampshade. In cutting the bamboo pieces, it is possible to cut them all at once or one at a time. However, it is imperative that they are all exactly the same length. It is highly recommended to use clear silicone caulk since ordinary glues will not work. Using a caulk gun, attach the bamboo sticks to the lampshade. Silicone bonds well to any surface such as bamboo. When attaching each stick, make sure it will stay in place. You can wrap a strip of masking tape to the lampshade once you have attached all of the bamboo sticks, and remove the tape once the silicone caulk dries up. Use your imagination and creativity when decorating the lampshade. It is possible to attach added embellishments that will go well with bamboo. The task is now complete and it is possible to sit back and admire the crafty work.